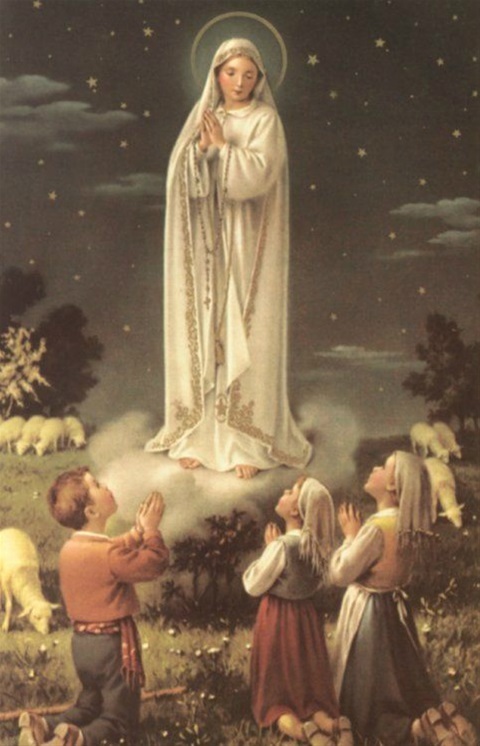 The Apparition of the Blessed Virgin Mary to Francisco Marto, Jacinta Marto, and Lúcia Santos. The three children: Jacinta (Marto), a girl of seven; Francisco (Marto), her brother, a lad of nine; and Lucia Santos, a girl of ten, at once knelt and began to say the rosary together. The children knelt down and began to say the rosary. When it was finished, they stood and brushed the dust from their clothes. “The lady is coming!” cried Lucia and ran down the hill to the little oak. The others followed. On July 13, the children were again waiting for the lady. This time there were about five thousand others waiting too. The lady told the children that she would work a great miracle in October so that all would believe she had appeared there. She also showed them a vision of hell, and it was so terrible that the children said they would have died of fear if the lady had not told them they were to go to heaven. Lucia Santos then narrates what happened next: “She opened Her hands once more, as She had done the two previous months. The rays [of light] appeared to penetrate the earth, and we saw, as it were, a vast sea of fire. Plunged in this fire, we saw the demons and the souls [of the damned]. The latter were like transparent burning embers, all blackened or burnished bronze, having human forms. They were floating about in that conflagration, now raised into the air by the flames which issued from within themselves, together with great clouds of smoke. Now they fell back on every side like sparks in huge fires, without weight or equilibrium, amid shrieks and groans of pain and despair, which horrified us and made us tremble with fright (it must have been this sight which caused me to cry out, as people say they heard me). The demons were distinguished [from the souls of the damned] by their terrifying and repellent likeness to frightful and unknown animals, black and transparent like burning coals. That vision only lasted for a moment, thanks to our good Heavenly Mother, Who at the first apparition had promised to take us to Heaven. Without that, I think that we would have died of terror and fear." Our Lady then gravely spoke these words: "You see Hell, where the souls of poor sinners go. To save them God wishes to establish in the world the devotion to my Immaculate Heart. If they do what I will tell you, many souls will be saved, and there will be peace... But if they do not stop offending God... He is going to punish the world for its crimes by means of war, of hunger, and of persecution of the Church and of the Holy Father."